Colonel Lou, retired Air Force sent me this. As always Lou is spot on. I have seen this many times but I love it so I want the world to see it. It is fine example of how big government logic works. Irony 1 “We are told NOT to judge ALL Muslims by the actions of a few lunatics.”BUT on the other hand……. How is that supposed to work…..?????? Irony 2.The Food Stamp Program, administered by the U.S. Department of Agriculture, is proud to be distributing this year the greatest amount of free Meals and Food Stamps ever, to 47 million people as of the most recent figures available in 2013. Maybe the National Park service should run the country and treat us all as animals, after all we are mammals. Is Man A Lessor Life Form? 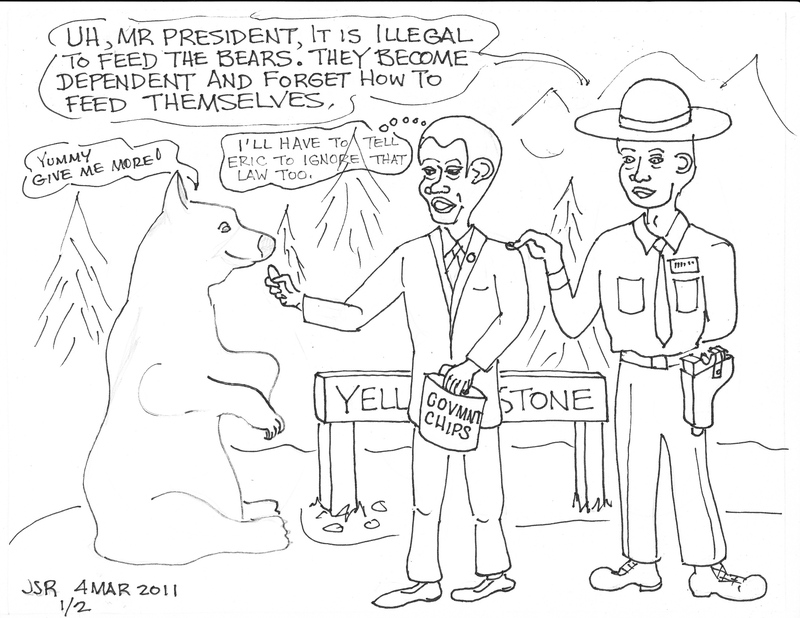 Back in March, 2011 I published a cartoon about this very irony. What sense do we make to the world, or to the universe, by contradicting ourselves so stupidly. Unless we mean that man is a lessor life form than other animals on planet earth. The Food Stamp Program, administered by the U.S. Department of Agriculture, is proud of the fact it is distributing the greatest amount of free meals and food stamps ever. Meanwhile, the National Park Service, administered by the U.S. Department of the Interior, asks us “Please Do Not Feed the Animals.” Their stated reason for the policy is because the animals will grow dependent on handouts and will not learn to take care of themselves. Thanks Dennis for reminding me how stupid our government is.